Welcome to NetPuzzleGames.com! We've searched the Internet and played hundreds of games to bring you what we believe to be the top puzzle games online. Jigsaw puzzles, Sudoku, word puzzles, puzzles of all sorts, shapes, and sizes. We just can't live without them, can we? When boredom sets in, when we are done with a hectic task and we want to relax, when we want to keep our smarts and brains sharp as ever, puzzles are there to the rescue! And here at NetPuzzleGames.com you get nothing but the BEST, most entertaining, engaging, and fun puzzle games found online. Whether you pride yourself as a master of problem solving, or if you want to kill some time while having fun in the process, NetPuzzleGames.com has something in store for you! For the masters of puzzle solving out there, you will surely love our global scoreboards! Solve puzzles and score as high as you can. Then, post it to our global high scoreboards for everyone to see and for you to compare where you are at in the puzzle games world. This is our way giving you a nice pat on the back and saying: "Good job! Well done!" All you have to do is sign up. Here's the best part: it's FREE! BUT what about the newbies? Of course, we didn't leave you out of the equation! If you are new to puzzle games and don't know where to get started, NetPuzzleGames.com's Top 10 list is the best place to start. Showcasing only the best of the best...the cream of the crop when it comes to puzzle games online, this section will introduce you to some of the most educational and most interesting puzzle games we have on offer. If the average online puzzle games are way too easy for you, the you will love what we have here at NetPuzzleGames.com! Take a look at Blosics 2 for example. A surprisingly difficult and physics based online game, many puzzle game lovers and enthusiasts fell in love with Blosics 2 - catapulting it to the number one spot in our Top 10 list! Presenting you with a platform that is jam packed with blocks as well as a large circular area to shoot balls from, the goal of Blosics 2 is to get the necessary number of points to advance to the next level. Check out the top right side of the screen to see how many goals or points you need to bag to move to the next level. Puzzle Games Where Fun Comes First! If that's your cup of tea, then Shift 2 (sequel to the exciting puzzle game... and a classic - Shift) will keep you on the edge of your seats! 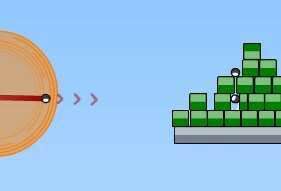 Combining the fun brought by stick figures and challenges of puzzles, you need to collect the trophy that you have won. BUT here's the problem, nobody wants you to get that trophy...or get out alive! With an interesting combination and an engaging story, Shift 2 is way too fun to miss! And those are just to name a few! Log in to NetPuzzleGames.com NOW - have fun and keep your wits sharp!